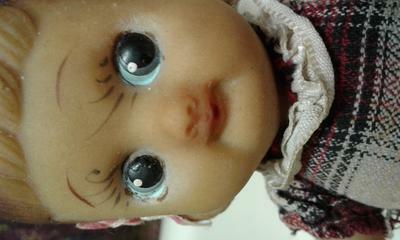 When my grandmother passed away I got this doll I always remember it being tucked way back corner of her China hutch. Nobody knows the story behind it.the doll us 7 1/2 inches tall bottom of the left shoe says JAPAN there are no other markings that I could find. It is a wind up from the back. Rubber head rubber that slides over the metal legs arms shoes and socks are molded wilt leg.